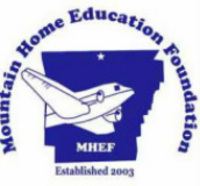 The Mission of the Mountain Home Education Foundation (MHEF) is to generate and distribute resources to the Mountain Home, Arkansas School District to enrich, maintain, and expand programs needed to meet the district's stated mission of excellence in education. Staff support for innovative efforts. Recognize staff, alumni and friends of the school district for exemplary contributions. Build community awareness for the MHEF. Inspire parents and the community to participate with the school district in enriching education. Project Promise is a scholarship program to help fund the tuition gap for all students graduating from Mountain Home High School attending two years at ASUMH. In effort to increase local workforce, the MHEF removes all barriers for post-secondary education. Teaching Grant Challenges create partnerships between community businesses, MH Public Schools, and MH classroom teachers to create an innovative classroom project. Traditional Scholarships provides funds for any Mountain Home graduate pursuing post-secondary education at any institution. Night of Honors is an event to observe excellence in community, volunteerisn, and professional work which recognizes former teachers, alumni, and community partners. Teaching Grants provides funds for innovative teaching and classroom enrichment projects.